July 4, 2015 July 4, 2015 Sarah M.
7am Salvation Army opens their doors early to offer 50% off apparel purchases. (With a little sorting you can find all sorts of great infant/toddler clothes. I have found countless sleep sacks for $1 or less, not to mention everything from Janie & Jack to Ralph Lauren infant apparel. As a Mother to an Infant with reflux we are constantly changing outfits. Had I not stocked up while pregnant we would’ve been living in our laundry room. Today’s Salvation Army Haul. 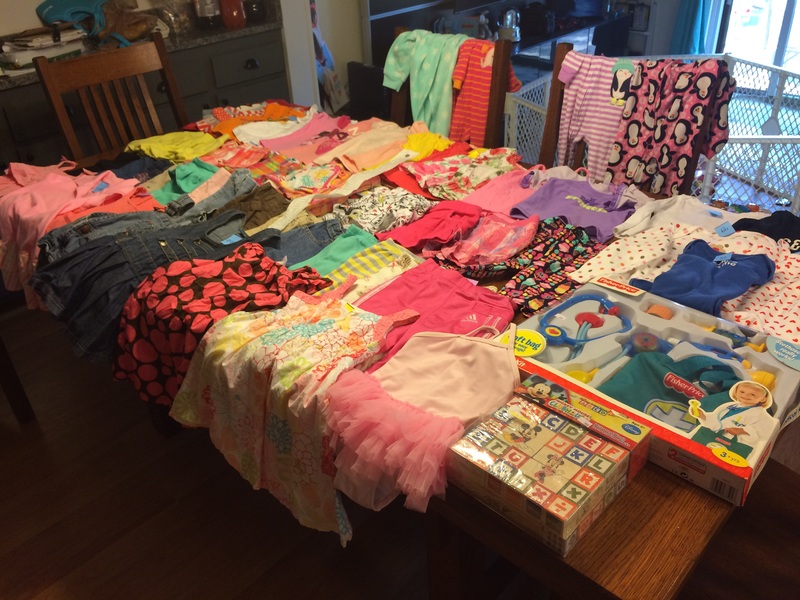 For $46 (roughly .82 per item), we walked away with quite the collection of 12M-4T clothes and a few new toys. Great deals on Janie & Jack, Baby Gap, Addidas, The Children’s Place, Gymboree, and more!